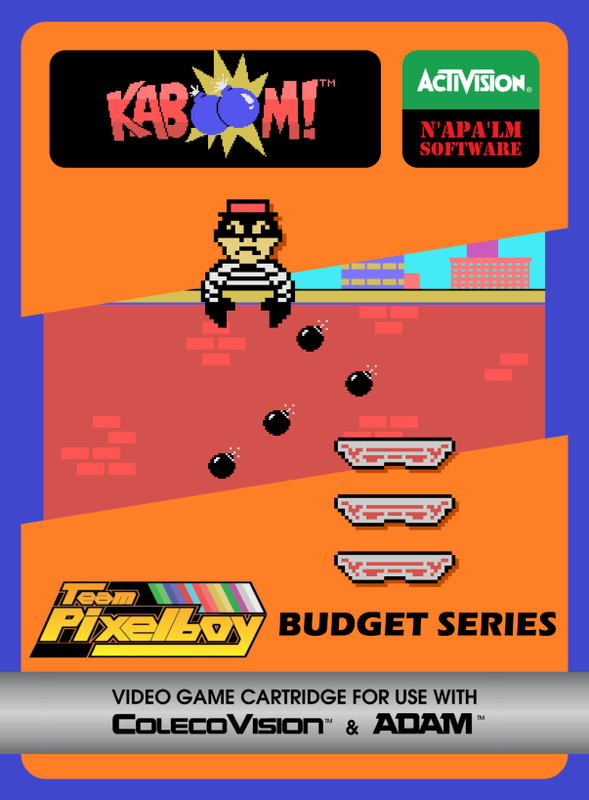 > Team Pixelboy Official Web Site : Kaboom! Our charming Mad Bomber really doesn't mean any harm. It's just that he loves nothing better than to drop his bombs and watch them explode! Only you can stop him! 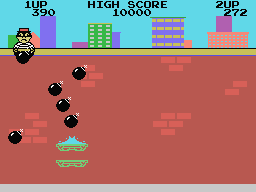 As he tosses his bombs, you race to douse their fuses with your buckets of water. The more bombs that splash in your buckets, the more points you score. But, the more points you score, the faster the bombs drop! 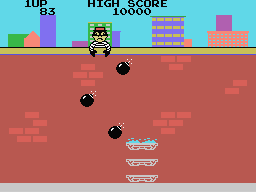 Miss a bomb, and you'll learn how "Kaboom!" got its name. 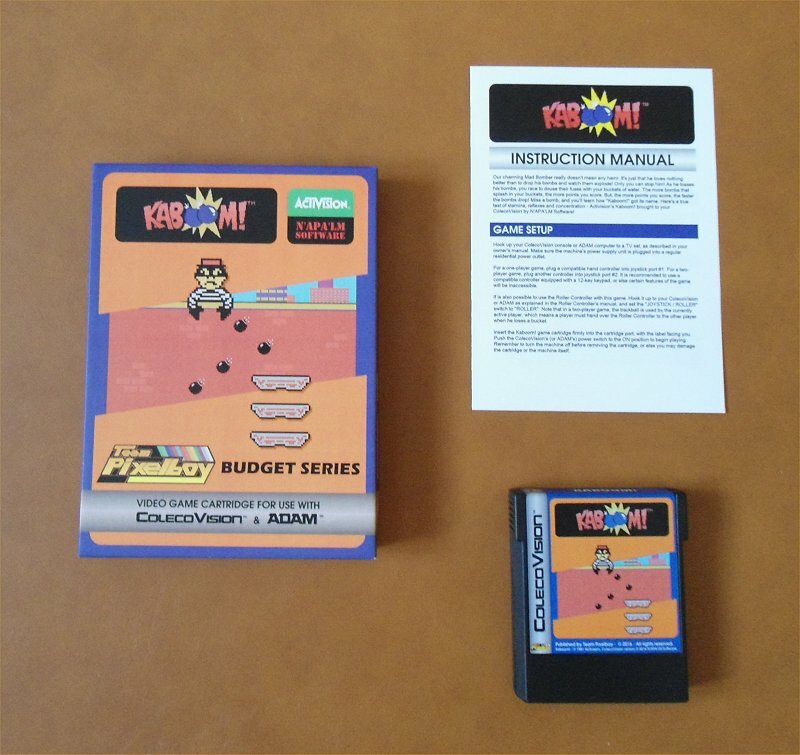 Here's a true test of stamina, reflexes and concentration - Activision's Kaboom! brought to your ColecoVision by N'APA'LM Software! Armando Pérez Abad was a truly big help in making this budget series what it is. Not only did he introduce me to several people in the MSX homebrew community, he also volunteered to program a few games from scratch just for the budget series, because he really wanted to help Óscar as much as he could. These games coded from scratch had to be simple enough to be coded rapidly, and I had to create the graphics myself for all of them, so I jumped on the opportunity and suggested several interesting titles. Armando accepted programming three of those suggestions, namely Kaboom!, Remember the Flag and Yars' Revenge. Of the three, Kaboom! was developed first. SPECIAL THANKS: Tobie St-Aubin, Tobie Boyer and Albert Yarusso. Here is some YouTube footage of Kaboom! for ColecoVision. Kaboom! - © 1981 Activision. ColecoVision version © 2016 N'APA'LM Software.